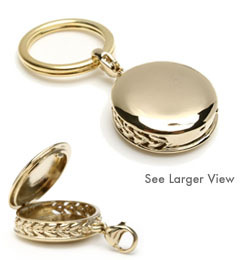 Aromatic vapors gently diffuse though the fine wreath of leaves on the sides of this locket. Just place a fresh wick inside, add a few drops of your chosen essential oil, and simply breathe. Soothing to the touch, this smooth, sensuous design has a remarkable calming effect when you touch it. Let us engrave it for you with “Breathe”, “Love”, or “Peace” to remember these secrets of well-being, or your initials to make it unmistakably yours.